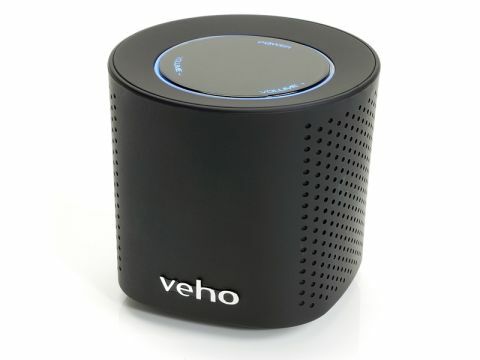 The Veho Mimi Qube Wi-Fi looks deceptively simple. It's a single small speaker that can fit in the palm of your hand, but it's capable of more than first seems possible. The size of this wireless speaker means you can place it almost anywhere within around 30 metres of the wireless USB dongle without trouble. The battery life is six hours, and the built-in rechargeable battery can be replenished by plugging it into a USB port. Because of its size, this speaker's sound quality isn't great, with some music sounding tinny. Although it looks like a single mono speaker, the Veho Mimi contains two 1.5 watt stereo speakers. These point in opposite directions, and the stereo effect is surprisingly good when the Mimi Qube Wi-Fi is directly behind or in front of you. Another handy feature, which points at this speaker's hidden depths, is the presence of Wi-Fi channel selector buttons on the USB dongle. The Mimi Qube Wi-Fi uses the same 2.4GHz technology as wireless networks, so other devices like wireless routers can cause interference and a drop in audio quality. To avoid this, you can use the buttons on the dongle to choose a free wireless channel. Another feature that might come as a pleasant surprise is the ability to connect an apparently unlimited number of Veho Mimi Qube Wi-Fi speakers to one USB dongle. You can buy the speakers separately, although this isn't much cheaper than buying them with the dongle. Each speaker plays the same audio channel, so you couldn't buy five speakers and a subwoofer, and create a wireless 5.1 surround sound setup. What you can do is set up speakers throughout your house and garden and stream your music to each one – ideal for parties. The Veho Mimi Qube Wi-Fi is small and stylish, but this comes at the expense of sound quality. However, if you want an attractive and expandable wireless speaker system, this could be for you.